Apr 5 We're on a boat! So back to our big adventure. After we had stretched our legs and the announcement came over the loud speaker, we got into the car. Dad started the car and we started following the line of cars. I got really nervous for a minute because I thought Dad was driving into the water! However, I quickly realized that we were driving onto a ferry. 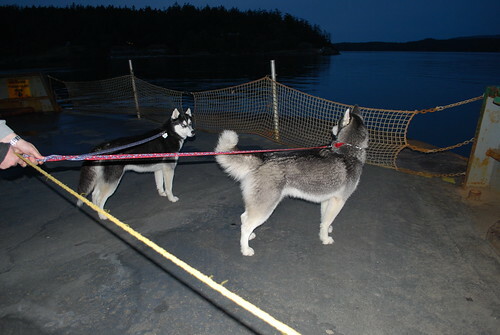 We mostly had to ride in the car while on the ferry because pets are only allowed on the car deck, but Mom and Dad did let us get out for a bit to let the wind blow through our fur. This picture was actually taken on the way home, but it shows us doing our best Titanic poses. 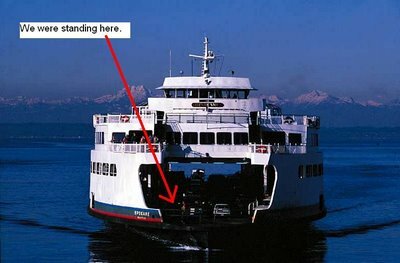 Here's a picture of a ferry and we have pointed out where we were standing. We rode the Ferry all the way to Friday Harbor, WA. Next I'll tell you what we did when we got there.